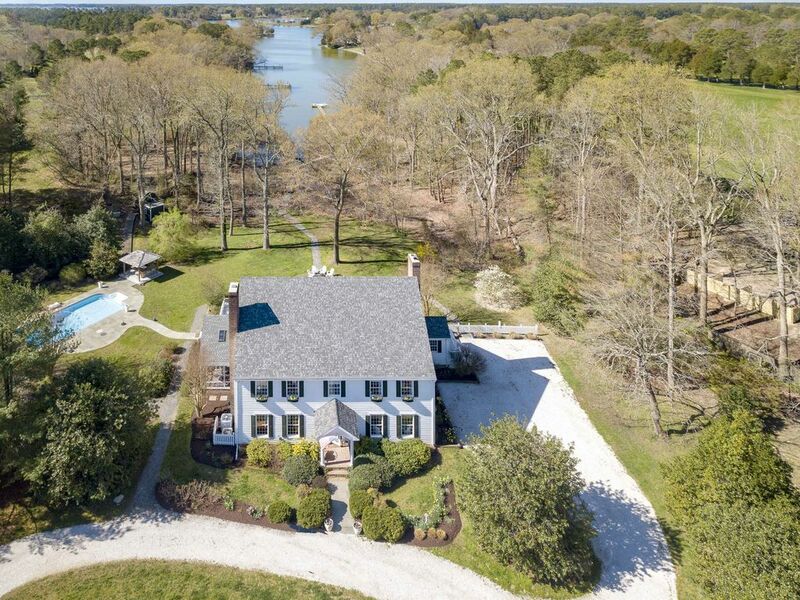 Quintessential charming Eastern Shore waterfront home stocked with all the amenities to make your stay stress free and relaxing. During the day you can enjoy the pool , tiki bar,gazebo; kayak on the quiet creek, play games or simply lounge on the new deck and soak in the views. A comfortable screened porch opening from the large dining room is also a great place to kick back or enjoy a bushel of crabs. The open kitchen/family room includes all you need (no need to bring spices, paper goods, condiments as we will provide) and is perfect for entertaining . Relax in adirondack chairs by the fire pit and when it's time to turn in you'll find comfortable beds and lush towels and sheets in each room. Located in between Easton and St. MIchaels, visitors can tour the towns and shop at a host of wonderful stores or visit the many attractions such as The Maritime Museum, Art Academy, St Michaels harbor, and wonderful Farmers Markets. There are also fabulous restaurants to choose from and many are waterside. A basket of local treats and all information will be here to welcome you. My husband and I both grew up in Easton and moved back in 2004 after spending time in DC and CT. Our family loves this house and property and we enjoy all the area has to offer. We've seen the changes over the years and the rather sleepy towns have turned into vibrant and fun ones. We love the great restaurants and shops plus we're only 45 minutes to Annapolis and 1 1/2 hr to the beach. We hope our guests have a wonderful vacation and we're happy to accommodate you anyway we can. We fell in love with this property the moment we saw it because of it's charm and location. It's such a classic Eastern Shore home! Honestly we're 7 minutes to Easton and 8 to St Michaels! The kids can kayak by themselves because there's no real boat traffic in the creek and it's so nice and quiet too. It's peaceful, has spacious rooms, and is great for entertaining. We also have a barn (on the adjacent property) so guests are welcome to pet the horses and mini donkeys (LuLu and CoCo). Large and spacious rooms with each bedroom having its own bath. The 3rd floor is complete with a queen bed plus 2 twin beds. It has it's own bath and living space with games and TV.. The pool is surrounded by pretty gardens and has a tiki bar plus a gazebo. The deck and screened porch are steps away as is the firepit. Kayaks are great fun and a wonderful way to explore the shoreline and see the wildlife! Enjoy life on Maxmore Creek which is right off the Tred Avon River. Kayak from the dock and explore the tranquil shoreline while viewing exceptional wildlife! platters, bowls, pitchers, vases, blender, mixer, etc All spices,oils plus extras are here for your use! Great for cooking and entertaining as friends and family can gather around the large island or watch TV form the family room. Opening to the deck , this provides great flow and wonderful river views. Elegant dining room with extra leaves for the antique table, crystal chandelier, and lovely artwork. Opens to the screened porch in summer and living room with fireplace in Fall/Winter! Large deck with dining table for 10, grill area, seating for 10, 3 umbrellas, steps to dock and pool. Kitchen, dining room, and porch all open onto the deck so makes it great for family living ! Lovely private pool with chaise lounge chairs plus others. Tiki bar, umbrellas, and floats!